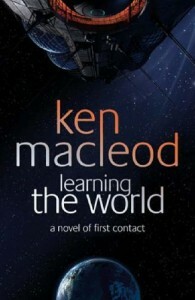 After eight novels and several shorter works some elements of Macleod’s stories were starting to be overused a bit so 2005’s “Learning the World” was a refreshing change – a novel not partially set in Scotland and with very little mention of A.I.s, Singularity Theory or obscure left-wing politics. The fundamental premise of the novel is revealed in its subtitle – “A Novel of First Contact” – this is a book that returns to a once-popular but now often neglected (at least in novels) subgenre of Science Fiction – the First Contact novel. In this case the contact is initiated by the crew of the eccentrically named starship “But the Sky, My Lady! The Sky!” - a huge generation starship full of human colonists travelling on a centuries-long voyage to found a new human colony in a previously-unexplored star system. They believe the star system to be uninhabited, a reasonable assumption because millennia of human exploration of space have not found any sign of any sentient alien races. However, their assumption in this case is not correct and they are surprised to discover as they decelerate into the star system that one of the planets is already inhabited. The planet is called Ground by its inhabitants; a winged race described irreverently by the main human character as ‘alien space bats’. They are intelligent, civilised but several centuries of technological and scientific progress behind the humans, still in an early industrial stage where they may have universities and scientists and a stable society but where the concept of a heavier-than-air flying machine is still regarded as the stuff of science fiction. They are however advanced enough that Darvin, an astronomer, quickly realises the implications of the new comet he has just found – a comet that appears to be decelerating in defiance of the laws of physics. The inhabitants of Ground have no way to contact what they suspect may be an alien spacecraft, and they are also distracted by a potential conflict between two of their major military powers, as well as some controversial questions raised by Darvin and his fellow scientists about their civilisation’s treatment of some of the semi-sentient lesser species on their planet. The incoming humans are also unsure how to respond. The main character, a teenage girl called Atomic Discourse Gale believes they should try to contact the inhabitants of Ground, but the more senior members of the expedition introduce a ban on communications while they study the problem, using their technology to spy on the planet while they ponder what to do. A large part of the human part of the book is based around the diary entries in Gale’s public ‘biolog’ as she wrestles with the implications of finding alien life and her exasperation at the actions of the older members of the crew. Gale’s biolog does seems likely to be a topical reference to the blogs that were starting to become a major part of the Internet society around the time the book was written, and its use is effective in making her an engaging character. This is a book that would easily have fitted into the so-called Golden Age of science fiction, it is a classic Science Fiction story in the tradition of Arthur C Clarke or Poul Anderson, although naturally the technology and physics is updated to modern standards. The novel largely ignores the political dimensions of Macleod’s other novels, instead concentrating on issues such as scientific progress and how to deal with encountering an alien civilisation. It makes an entertaining, interesting and compelling story, although one flaw is the slightly rushed (although admittedly clever) ending. Both the human and alien protagonists are interesting and entertaining characters, both largely used to introduce the reader to their respective worlds. Atomic Discourse Gale provides a viewpoint on her world, the generation starship she was born in that is the only world she knows while Darvin and his colleagues are used to provide an introduction to their species’ society that skilfully avoids clumsy exposition. In summary, this is a good novel that sees Macleod moving away from the premises of his other novels and instead choosing to write an entertaining modernisation of the “First Contact” novel subgenre.